Hello everyone! Today, I have the very great pleasure of hosting an interview with Miss Elizabeth Rose, author of Violets Are Blue! First off, I want to congratulate you! Your first ever published novel! How does it feel, holding a hard copy of your book in your hands? It feels surreal. I still see the book on my shelf and think it was written by someone else. I can hardly believe the last few months aren’t just a dream. I was very interested in the history of the Titanic, but I wanted to tell the age-old tragedy in a manner that was new, fresh, and different. 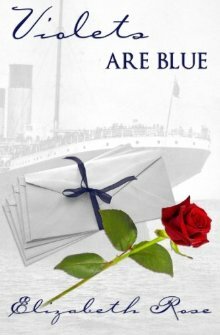 I had noticed that many books tended to tell the story from the perspective of a passenger on the Titanic — certainly there was no need for another book of this type. I started wondering about the emotions of the people in America who had friends and family members on the doomed ocean liner. What were their emotions when they heard the news? After that, everything seemed to fall into place. Did you have to do a lot of historical research? Surprisingly enough, no. I spent more time researching life in Eastbourne, Violet’s hometown, than I did reading about the Titanic. As I mentioned in the previous question, this ship was a particular interest of mine, and I had already read several books on the subject. I did a bit of menial research — I wanted to know the weight, length, number of lifeboats, etc. — but I already knew the general facts by heart. What are a few similarities between you and your main character, Violet? Violet and I both love to write. That is the most dominant similarity, I think. It is mentioned in the book that Vi is much more regular with her letters to Lilli, while the latter will sometimes go several weeks without writing. We also love the familiar things in life, and don’t adjust to change well. Violet has a hard time accepting New York as her new home, and still clings to Eastbourne for a time. Did you hit a lot of roadblocks? Yes, some bigger than others. My largest problem — and this is not related to VAB alone — is the little, everyday scenes. When I have an idea for a book, I normally see the dramatic, heartbreaking moments, the triumphant conclusion, the scenes that most people remember when they read a book. But books cannot live on drama alone, and one needs just as many calm, comforting scenes to balance them out. It can be difficult for me to come up with something that is small, but still contributes to the book’s plot. Where do you go/what do you do when you get stuck? If I am experiencing only a slight bit of writer’s block, I try to press on for a time, and I normally it lessens. However, if the case is more extreme than that, I lay down my pen or get off the computer. It can be helpful to give your brain a rest from writing for a short while, and when I come back, I am much better suited to continuing my story. Besides, a book is supposed to depict some aspect of the world around you, and how can you properly portray that if you only stare at a computer screen all day? Any tried-and-true methods for gaining inspiration? I have three methods, actually. The first is to read. There is nothing so inspiring as the works of great writers, and it can give you some practical advice on how a good book is written. The second is tolisten. Dialogue can be the trickiest part for a lot of authors, and it helps to listen in on the conversations of those around you. Instead of keeping yourself confined to a bubble of what you think people ought to say, actually listen to real people speaking. It’s amazing how helpful this is. And the third? Live. You wouldn’t believe how many ideas for a book I get from the people around me. Naturally, they don’t all become 50,000-word novels, but even the smallest glimpse of a scene can be a catalyst for other possible book ideas. What part did your family play in the publishing of this book? My family was supportive the whole way through, from that evening in June when I said I had a chapter for a book I was writing that I wanted my father to read, to this day. That whole summer of 2010, Daddy would read a chapter aloud at the breakfast table nearly every morning, giving me both praise and critique. At first it felt a bit uncomfortable — my books are almost like my private thoughts, and hearing them read aloud takes some adjustment — but I feel it helped me improve a good deal as an author. When it was time for me to publish, Daddy and a family friend helped me design the cover, properly fit the interior pages, and set everything up with Amazon’s Create Space program. It has been a better experience because of their involvement. I have many literary heroes and heroines, but for the sake of brevity, I will name C.S. Lewis. Every time I read The Chronicles of Narnia, I love them more. He has a way of stating something that makes me think, “Of course! Why didn’t I think to put that into words before?” Much as I love Jane Austen, Victor Hugo, Louisa May Alcott, Charles Dickens, and Baroness Orczy (yes, I did just fit another five authors into this answer ;)), I think I can safely say that C.S. Lewis inspires me the most. Besides, he began a book with the sentence, “There was a boy called Eustace Clarence Scrubb, and he almost deserved it,” and that alone is reason enough to love him. What message do you hope your readers take away from Violets Are Blue? I have two messages that I hope my readers will detect. The first is that there are always people in the world worse off than you, and we need to adjust our thinking to see the blessings in life, instead of looking for the blemishes. And second, there is a proper way to go about mourning, and though it feels right to ignore everything else and lose yourself in sorrow for a time, that is actually a very selfish and immature way of reacting. We need to pray through our trials and seek comfort in His love. We cannot lose sight of reality, nor should we wallow in our grief so long that we think God has abandoned us. Thank you for letting me stop by and chat with you, Gwen! Thank you Lizzy for letting me host you! It's been a pleasure!